With around 261 million native speakers, Bangla/Bengali is the primary language of Bangladesh and few states of India. A big part of the Bengali culture is the arts, music and dance and with the growing number of Bengalis in Seattle and surrounding areas, the Bengali community in the Seattle region decided to produce more events for people to come and enjoy, and mostly remember home. In January of this year, my husband Durjoy and I started a non-profit organization called Shilpi Shuhreed Foundation in order to give bigger meaning to what we do. Shilpi means musician, and Shuhreed means friend. Funds raised from the upcoming concerts and events will go toward supporting musicians in Bangladesh who cannot afford treatment when critically ill.
usband and I feel lucky to be a part of a community here who believes in helping these musicians out. We welcome and urge members of all other communities to also come and support us and enjoy the events we have to offer. We will be hosting our first concert on March 30, 2019. We welcome Sahana Bajpaie, an internationally renowned Bengali musician, who is best known for singing songs written by Nobel laureate Rabindranath Tagore, who is often referred to as the “Shakespeare of Bangla”. Sahana attended school in Shantiniketan in West Bengal. Sahana has been performing since she was a teenager and has developed a unique style in singing traditional Bengali music. 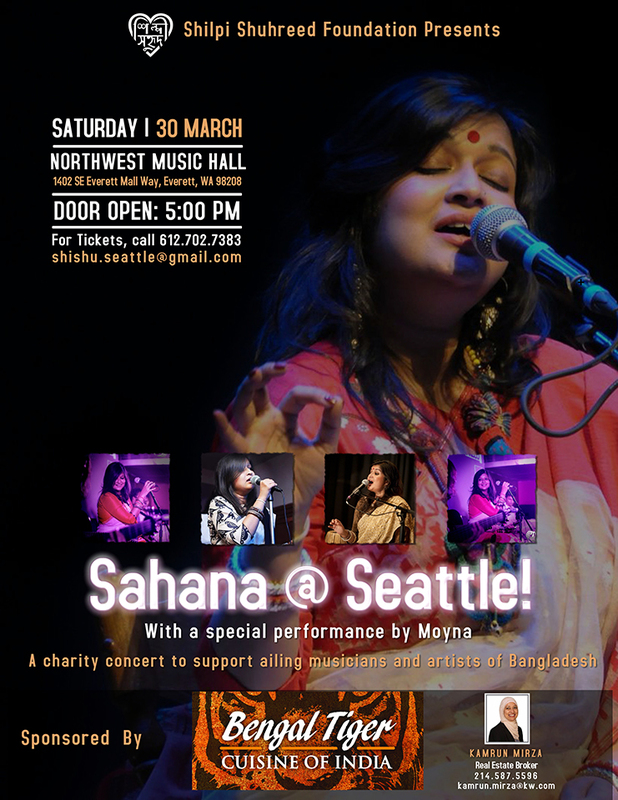 We invite you all to come and watch the Sahana Bajpaie – Live in Seattle Concert on Saturday, March 30, from 6:00 PM to 9:00 PM. The concert will have an opening act by our duo-band, MOYNA. This event will take place at the Northwest Music Hall by Everett Mall. Tickets can be purchased on Eventbrite.com or by directly contacting Shilpi Shuhreed Foundation at [email protected].